Today I have Jamie Scallion, musician and author of upcoming book The Rock ‘n’ Roll Diaries talking about his writing process, I love seeing into the world of authors and how often little things are different for different authors. Jamie’s process sounds great and I can totally relate to talking to yourself while writing – even if I only write non-fiction! Read on to find out more! When the wonderful Raimy asked me to say a few words on my writing process I originally thought wow, will anyone be interested? It’s so boring. Then I started to think about it and I decided (rather arrogantly I suppose) that it isn’t boring. One of the main things a writer must get used to is the solitude. Spending large swathes of time alone isn’t for everyone. I come from a very collaborative and social working background. I was in a band and this is by its nature a “living in each other’s pockets” environment. Of course when I started writing I was on tour and it was a very different process to the one I have now. You could say The Rock n Roll Diaries was born out of boredom. There’s a lot of spare time when you’re touring and I wanted to fill it up with something. Now, I don’t tour as an artist, although I do go on the tours with The Script boys. This is very important to the process, because watching a big band go about their business informs the band/book in an authentic and imperative way. I find it hard to work longer than four or five hours on new writing. If I’m going through the editing process with my editor then I can last longer. My process is very standard and habitual I think. I start writing at around twelve noon, have lunch in front of my screen and I sip water throughout. Sometimes, if I feel the writing is slumping I will stick Spotify on to wake me up. I write standing up. I have constructed a platform so I can put my keyboard, mouse and screen up high. I started doing this when I had a bad back ages ago and it stuck long after my back got better. I find standing up to write is for me. I can pace around the room if I am stuck or just pondering. Before I get going on the first draft of a book I write the ark of the story and pen lots of notes about character, plot, scenes etc. Once I’ve started I can refer to the notes but often I will go off piste and improvise the sequence. I think it’s very important to have this freedom in that initial draft. You never know what you might come up with. Finally, I am very lucky because I have a fantastic editor to help me. This really is a very important partnership. I deliver my third draft to my editor and that’s when the fun starts. She reads and makes notes all the way through – suggestions for changes, ideas to strengthen a scene with extra dialogue or narrative and sometimes suggestions on new scenes. For me this is when I feel most excited because suddenly you get to find out what parts of the book are working and what parts need more. This process can go back and forth many times until we’re both happy with it. Then it’s time for the copy edit and proof read. THEN, it’s time for people to really see what it’s really made of. 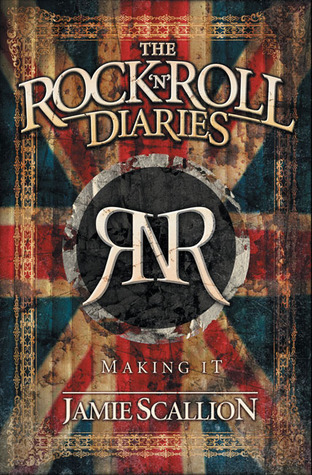 Jamie’s book The Rock n Roll Diaries: Making it was released in November 2013 through Mad Notes Media. To find out more visit the book’s Goodreads page.